The murder of a Lebanese supporter of the Brazilian team in the FIFA World Cup has compounded the fears of the country’s security forces that also have to contend with terrorist threats. Mohammed Zaher was stabbed to death by a German team fan on Wednesday in the Hayy al-Sellom neighborhood in Beirut’s southern suburbs. The perpetrator Hussein Breitei, 17, stabbed the victim, who was celebrating Brazil’s victory against Serbia in the World Cup. The Army Command announced on Thursday that Breitei has since been arrested. Lebanon has never qualified for the World Cup, but its people are avid football fans, the majority of whom support Brazil, Germany and Italy. The locals often take to the streets to celebrate a football victory and these celebrations occasionally turn into scuffles. Officials themselves are football fans. Prime Minister Saad Hariri and Speaker Nabih Berri support Brazil and Information Minister Melhem Riachi supports Germany. The minister joked that he may have to stop state television, Tele Liban, from broadcasting the World Cup for free after Germany crashed out of the tournament on Wednesday. Other disputes erupted in the country on Wednesday night. 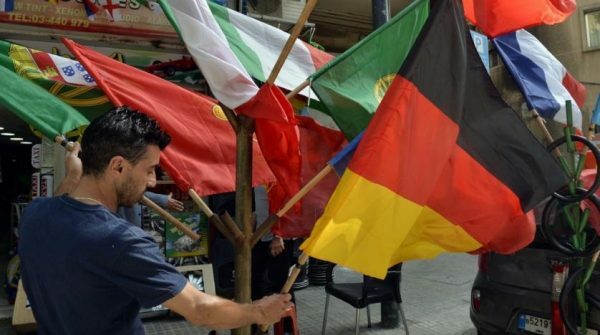 In the northern city of Tripoli, Germany and Brazil fans clashed over the latter’s victory. Locals soon intervened and the dispute ended without any injuries. The security forces and army have since opened an investigation in the incident and arrested those involved.